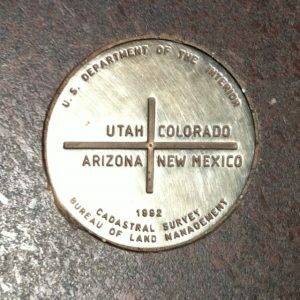 Years ago, my husband and I stopped at the Four Corners Monument, the only spot in the United States where four state corners meet. It was a dusty place that had been coaxed into importance with small shops selling Indian wares, and the addition of a marker, molded brass if I remember correctly. By placing my hands and feet just so, I was able to be in four places—Utah, Arizona, New Mexico and Colorado—all at one time. The main thing I remember about that outing was the dark thumb of rock that was visible far away on the horizon—Ship Rock. 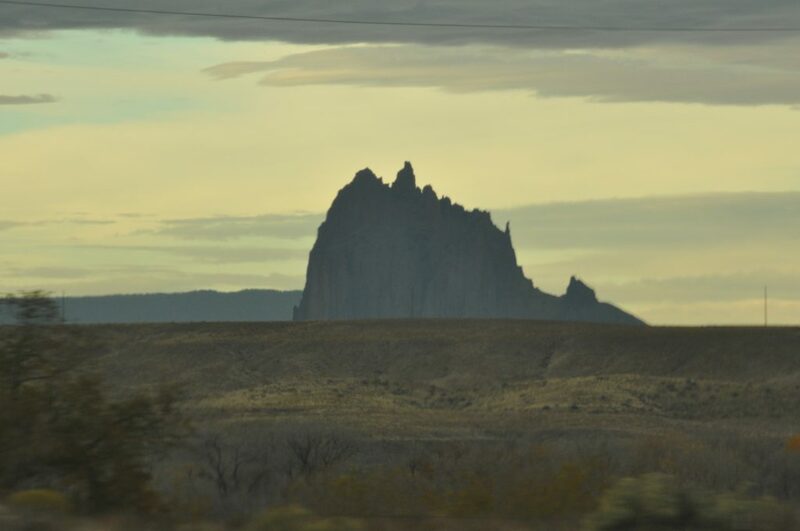 We didn’t go see Ship Rock that trip, but recentlywe went into New Mexico specifically to visit Shiprock. New Mexico must have been at one time a boiling cauldron of volcanic activity. We have more extinct or sleeping volcanos in New Mexico than almost anywhere else in our country. Sierra Grande, Mount Capulin and Rabbit Ears outside of Clayton, NM were all a part of my childhood. The Malpais, a massive lava flow near the White Sands National Monument and visible from space, bears witness to more recent volcanic activity. Ship Rock is the core of an ancient volcano. 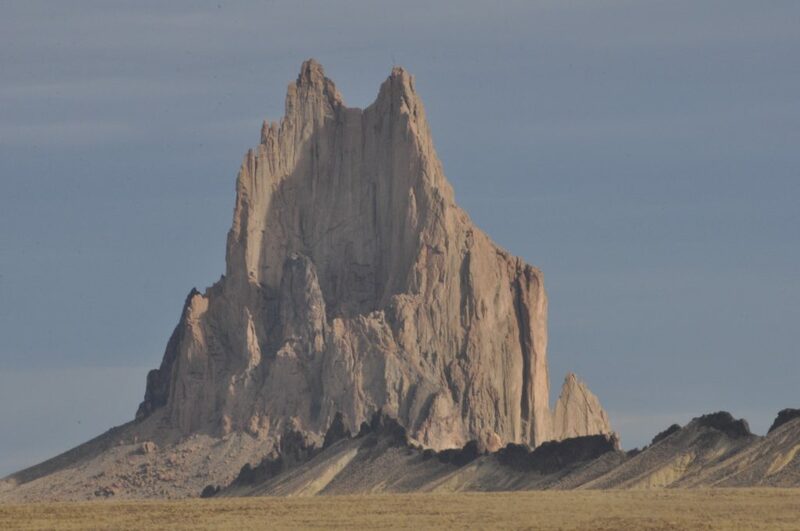 The Navajo have a legend about Ship Rock, about its flight from near Sleeping Ute Mountain to its current home not far from Farmington, New Mexico. During a massive flood, a friend of Talking God needed to cross to the other side of the flooded San Juan Valley. Ship Rock did not get along well with Sleeping Ute Mountain. The two mountains were too competitive. When the friend of Talking God needed some way to cross the water, Ship Rock took flight with its two mighty wings and a tail that are still visible and carried the god across the water and on to the mountain’s current home. Another tale tells of the People being in danger. Ship Rock crossed an unnamed ocean to bring the People to safety in the land where Ship Rock now stands. These stories were gathered by an early day Mormon trader, Will Evans, and published in his book, ALONG NAVAJO TRAILS, RECOLLECTIONS OF A TRADER.. The ridge of lava that stretches on one side of the mountain and the broken pinnacles on another side make one wonder if there is not some truth to the tales. The area has a sacred feel and is indeed thought to be sacred by the Navajo people. On this same trip, we visited Mesa Verde National Park. I had a moment’s vivid flashback as we parked in one of the overlook parking spaces. 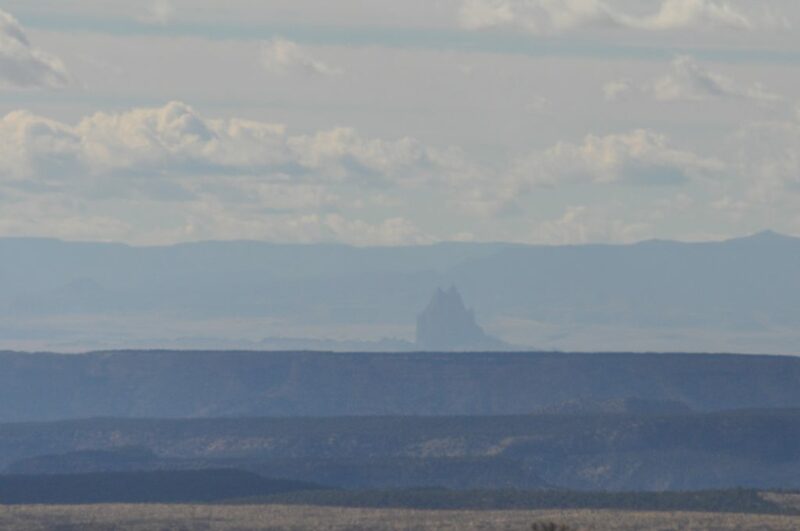 Against the horizon in the far distance and barely visible, we could see Ship Rock again, a pale blue shadow of rock .